A disaster recovery (DR or BCP) plan provides a structured approach for responding to unplanned incidents. That minimizes threats to the enterprise's infrastructure. That includes hardware, software, networks, processes and people. Protecting your firm's investment in its technology infrastructure, and protecting the firm's ability to conduct business are the key reasons for implementing a disaster recovery plan. 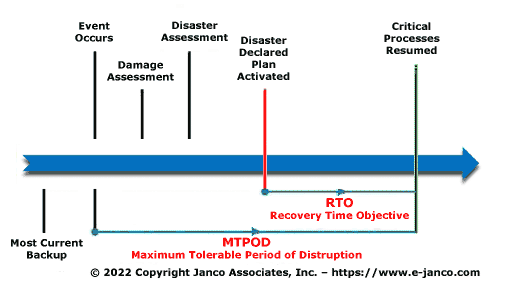 Janco's free disaster recovery - business continuity template will help facilitate the initiation and completion of a DR plan. Preparation for a continuation of operations in light of SOX has two primary parts. The first is putting systems in place to completely protect all financial and other data required to meet the reporting regulations and to archive the data to meet future requests for clarification of those reports. The second is to clearly and expressly document all these procedures so that in the event of a SOX audit, the auditors clearly see that the DRP exists and will appropriately protect the data.